I thought we would go down memory lane today. 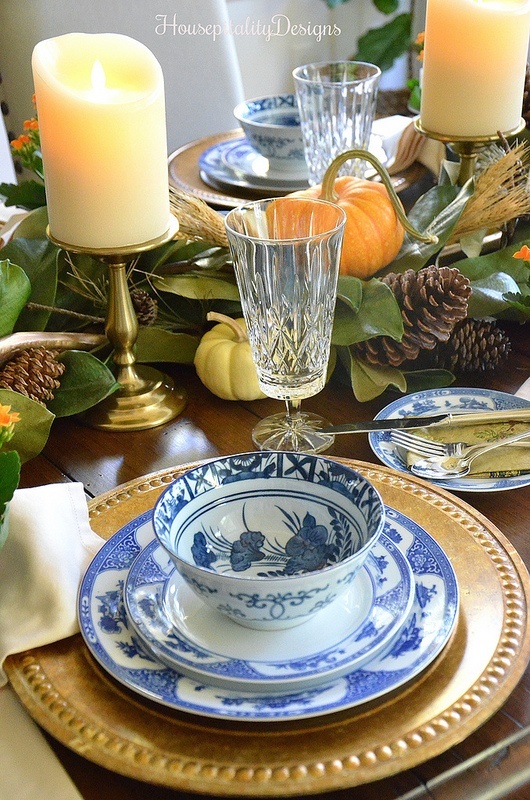 To revisit my Blue and White Fall Tablescape with orange accents. 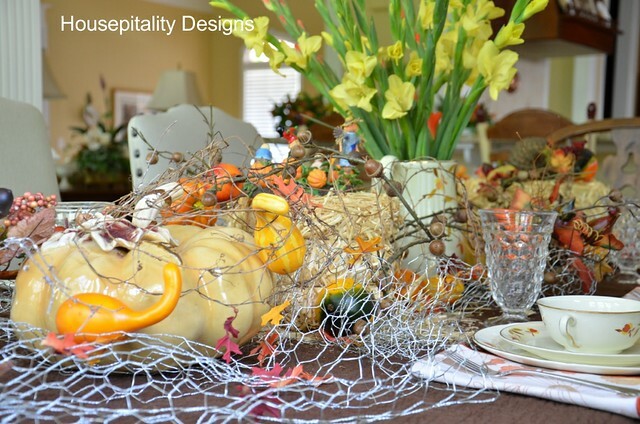 I began creating the elongated centerpiece by using a faux magnolia garland. 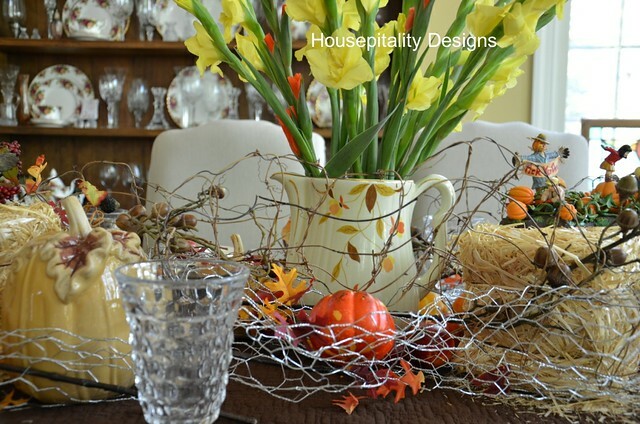 to use as a base to create that long narrow look we all have grown to love. 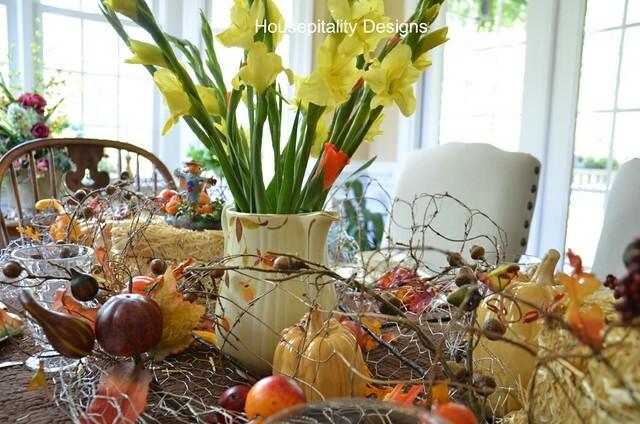 Using a garland is a great way to start. 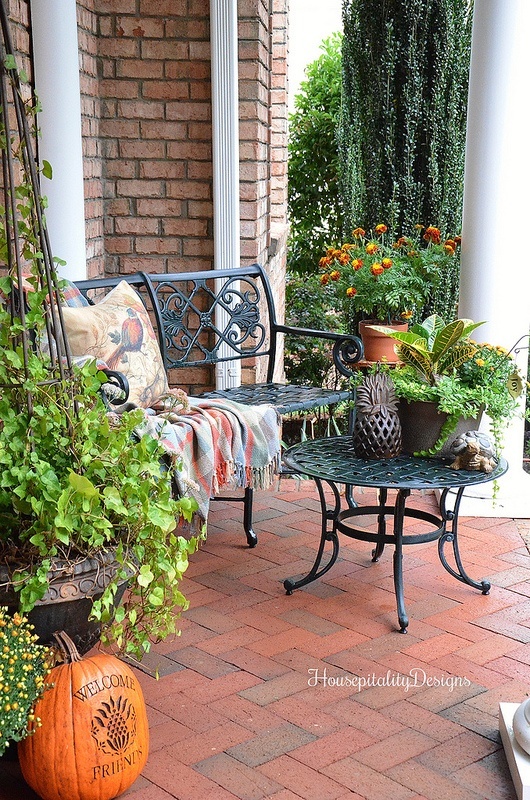 from fabulous craft projects, home decor, and gorgeous porches and gardens. and I hope to do a recap on one of them soon. 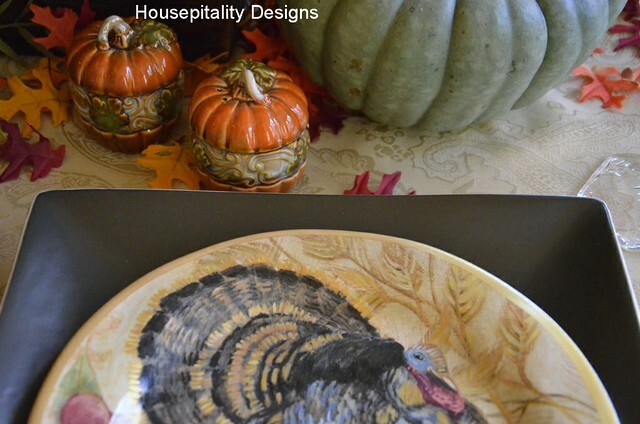 starts today with a great giveaway! 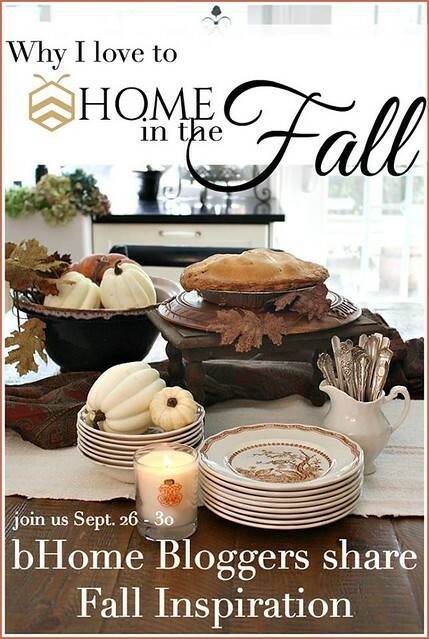 It’s the bHome Fall Tour with a $250.00 Amazon Gift Card Giveaway! and she can have 75 plus people in her home and it never feels crowded. 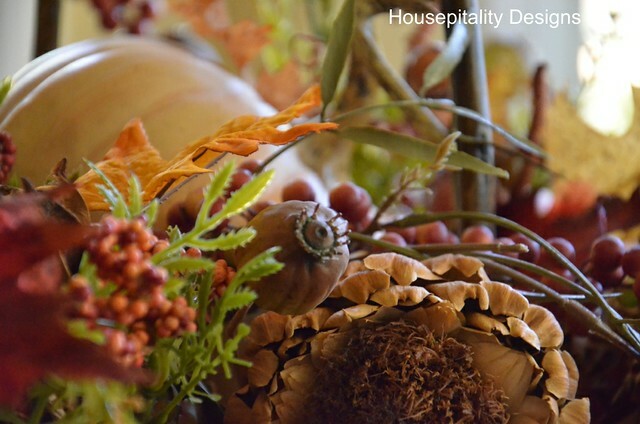 She has been known to feed that many at Thanksgiving. 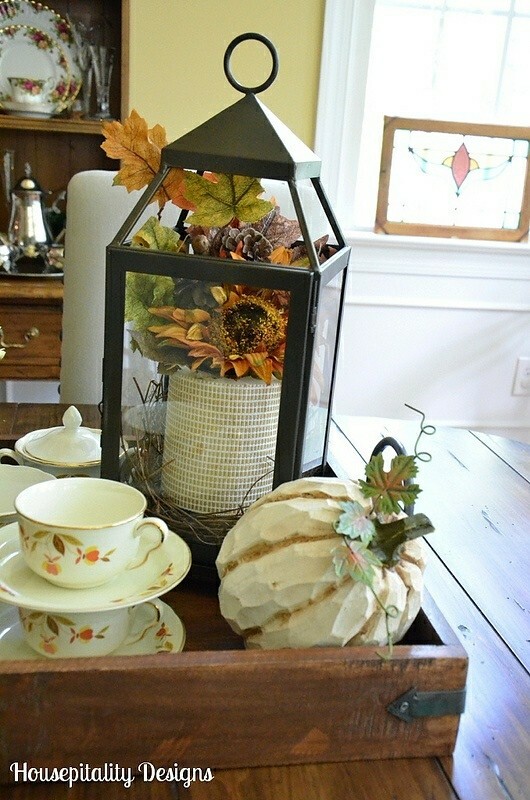 I created this table a couple years ago and was vintage and Pottery Barn inspired. wonderful bloggers who over the years have become great friends. and there was some discussion of this during the conference. 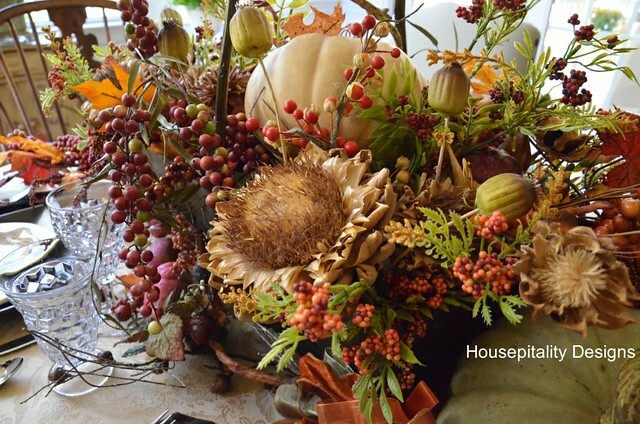 Then a sweet, talented blogger moved to our area. So, how do you welcome her? Have a gathering. Happy Monday ! ! ! 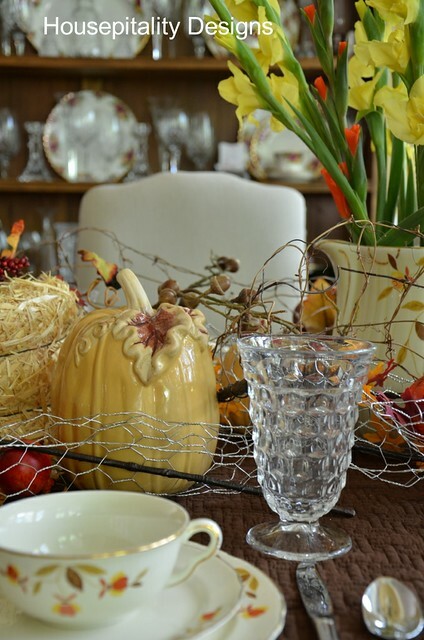 It is such a beautiful Fall day here today. 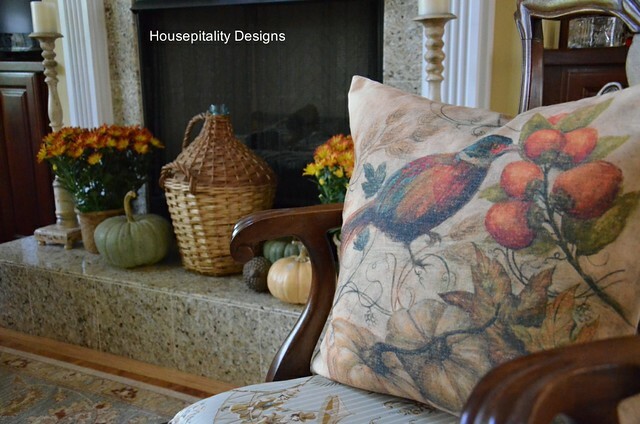 So in celebration of Fall . . . I thought I would do a bit of a throwback today . 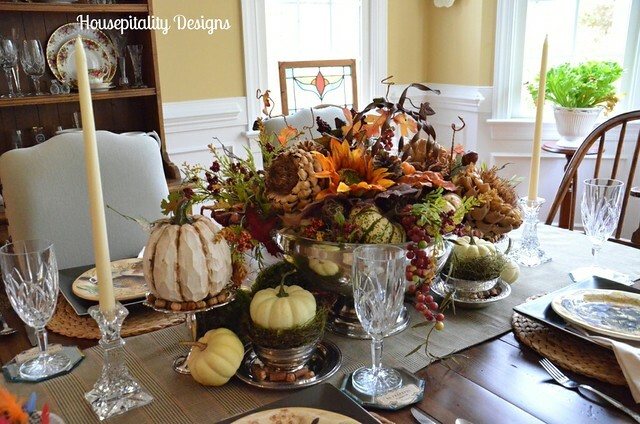 . .
~ ~ of a Fall tablescapes and vignettes. 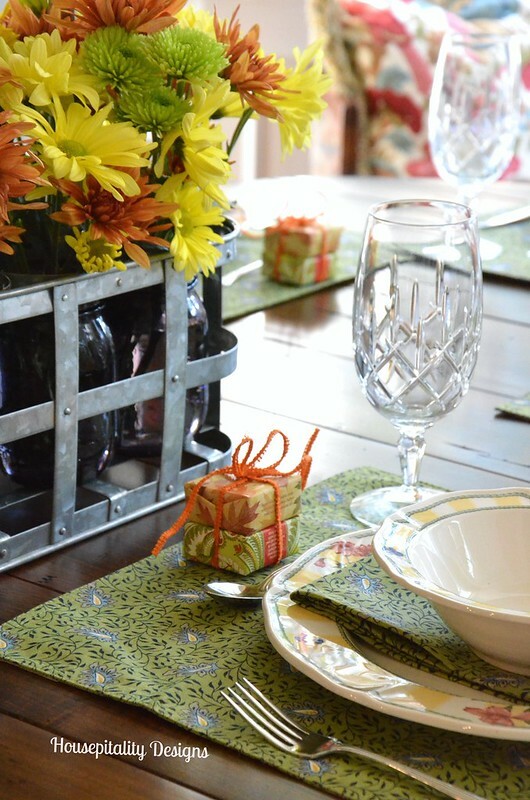 Began the creation of the tablescape with a glen plaid table runner. 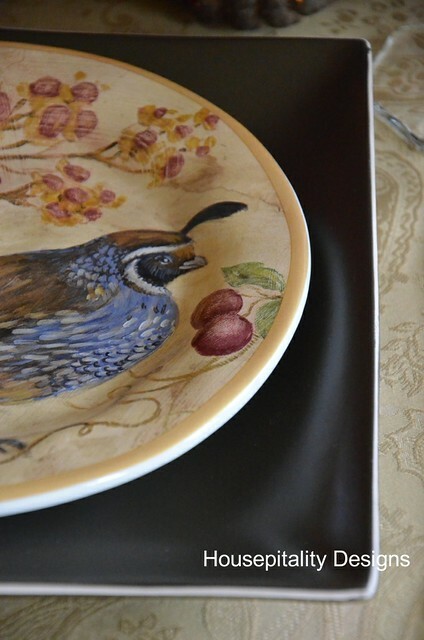 . .
~ ~ that was a French Laundry purchase at the Country Living Fair last year. 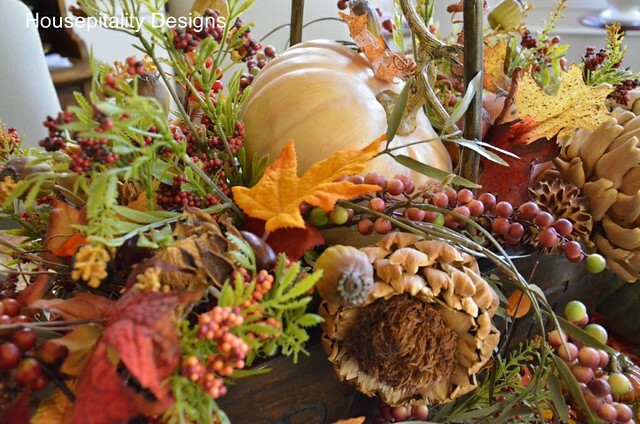 I am in a “Fallsum” (In between Summer and Fall) state of mind. 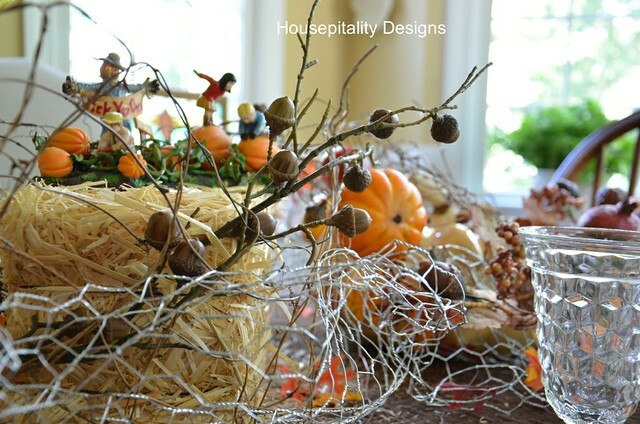 Looking back on my Fall creations both indoors and outdoors. 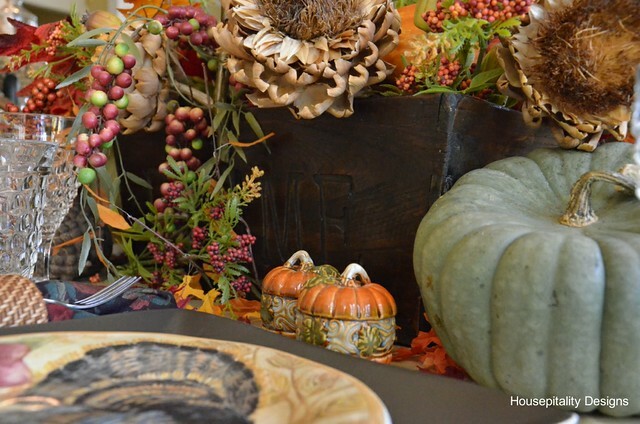 A Fall Tablescape….Pottery Barn Inspired. 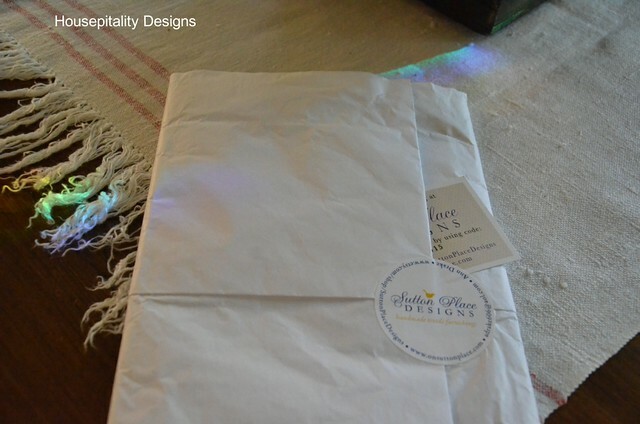 Who cannot resist the beautiful products of Pottery Barn..I can’t! 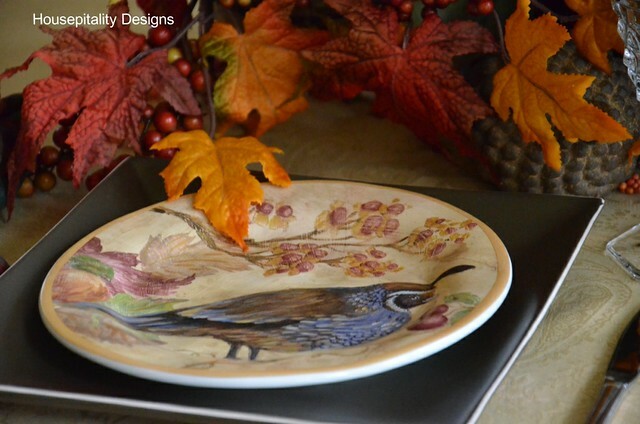 …..I saw these plates this Fall and had to have them. 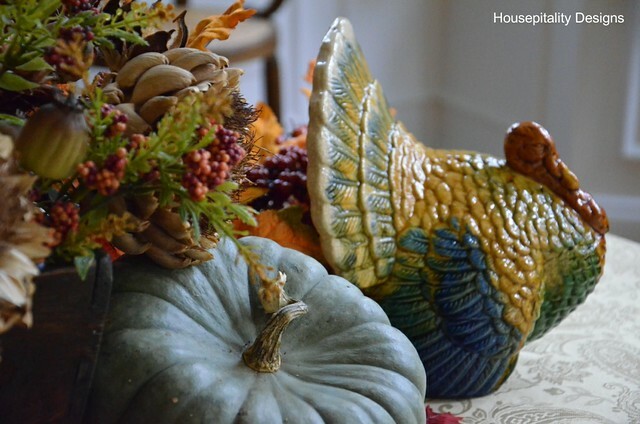 I used them throughout my Fall decor in my home. 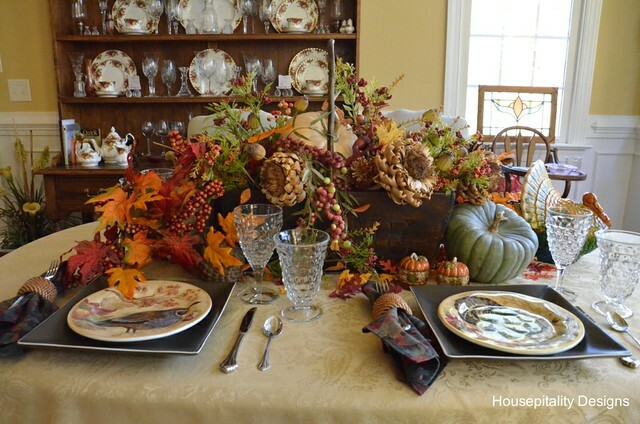 So today, I gathered them together and created a Fall Tablescape. 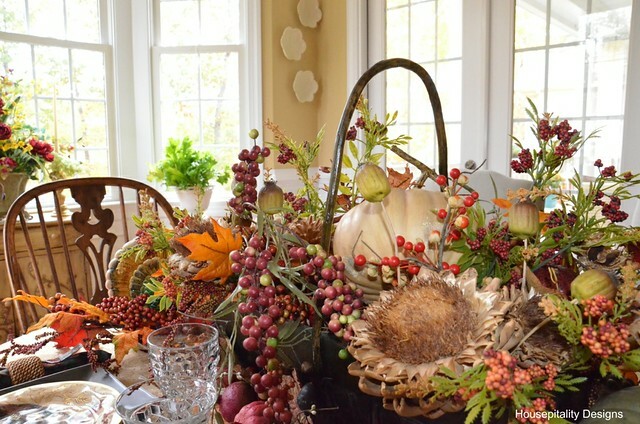 I gathered my collection of Fall foliage and started creating a centerpiece in my wooden French apple basket.. 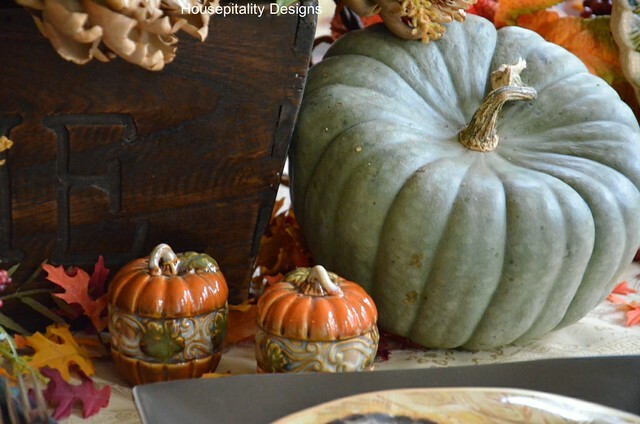 This cute faux pumpkin is also from Pottery Barn. 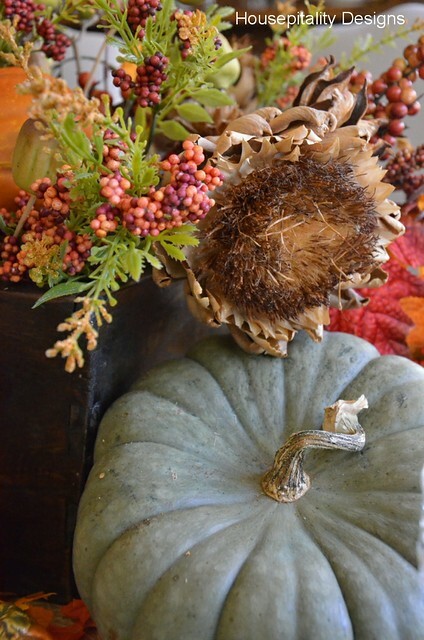 And then there are the real pumpkin/gourds…love the color! 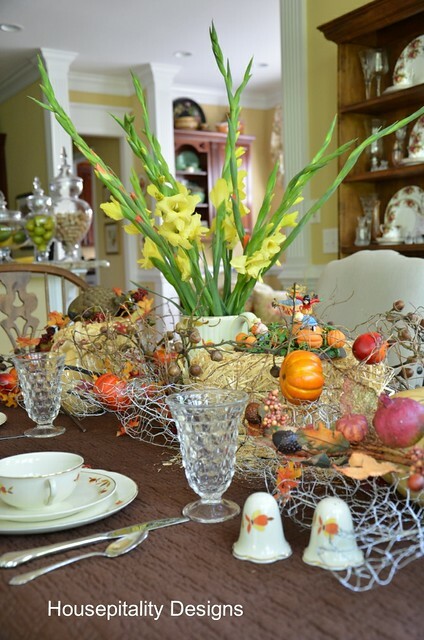 Such an incredible time of the year to count our blessings as “We Gather Together”…. 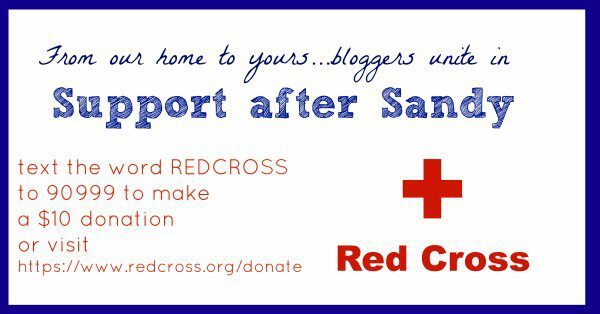 …..I cannot help but think of the many people who have suffered the devastation from Hurricane Sandy. 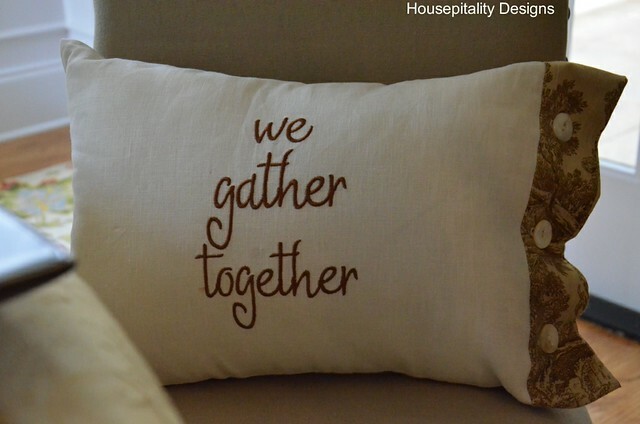 So as “We Gather Together” this season…. 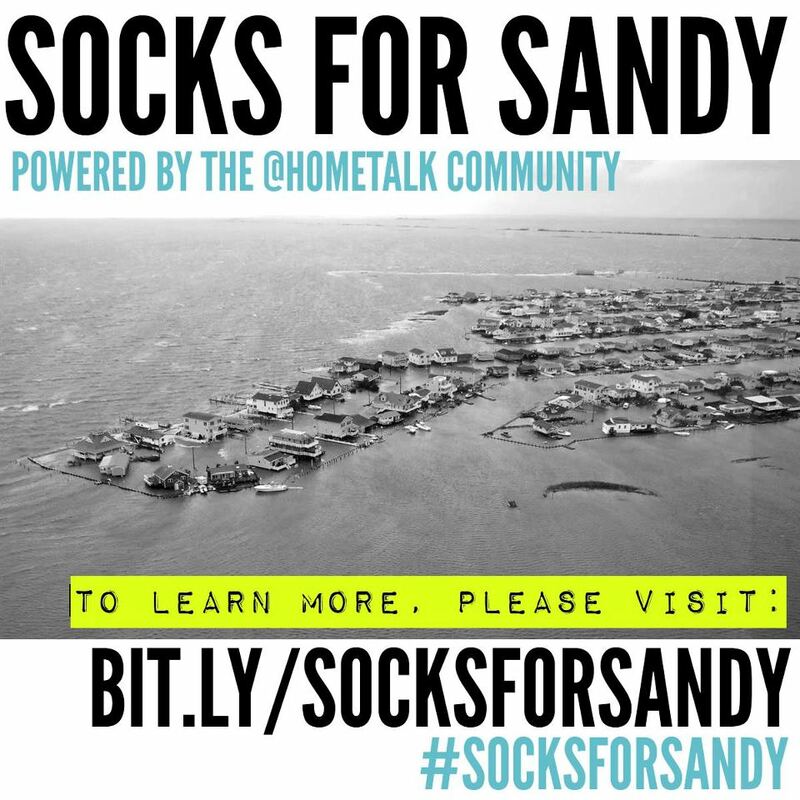 HOMETALK is supporting a great cause to help with the victims of this disaster…. 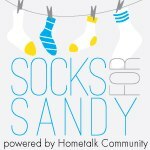 …..It is called Socks for Sandy….to provide the much needed warmth of socks, hats and gloves to the victims. 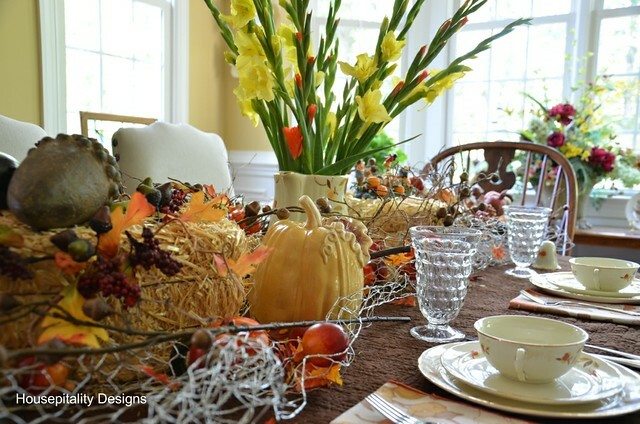 Please mail by Friday, November 9th…as these items are so urgently needed! For more information, click on the image below…Thank you for your consideration in participating in this great cause…. 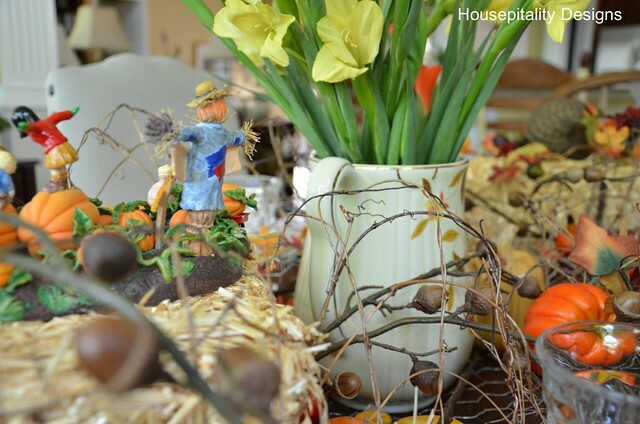 Whisperwood Cottage is having a Fall Decor Contest…. 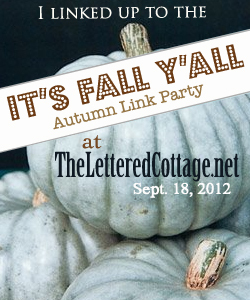 The winner gets the tremendous honor of being published in the Cottages and Bungalows magazine…. 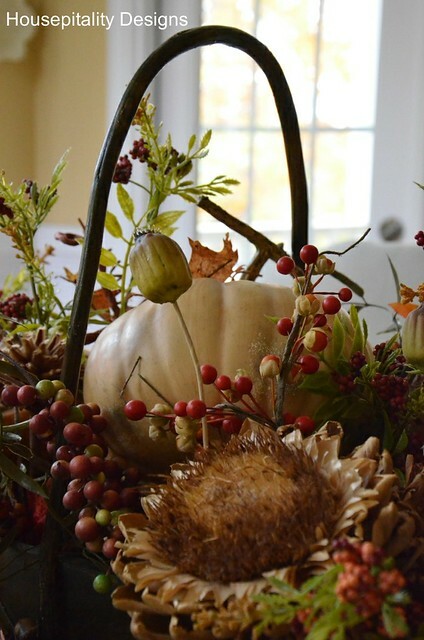 So I sent hubby up to the attic to retrieve some fall decorations…. ….and those who know my hubby…. ……….he knew just where to go…Aisle 2, Shelf 3. 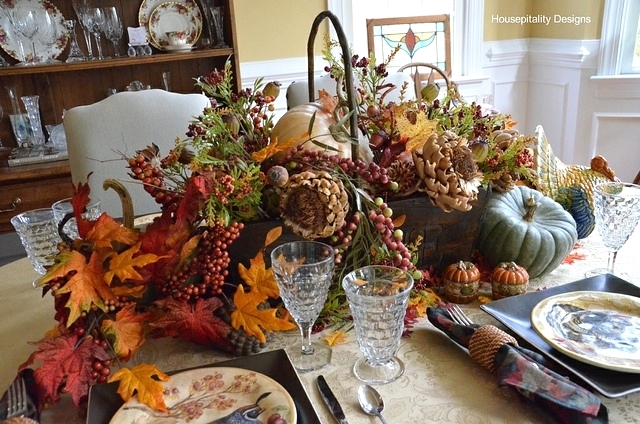 It was a bit funny doing a Fall Tablescape when it was 90 degrees outdoors…. 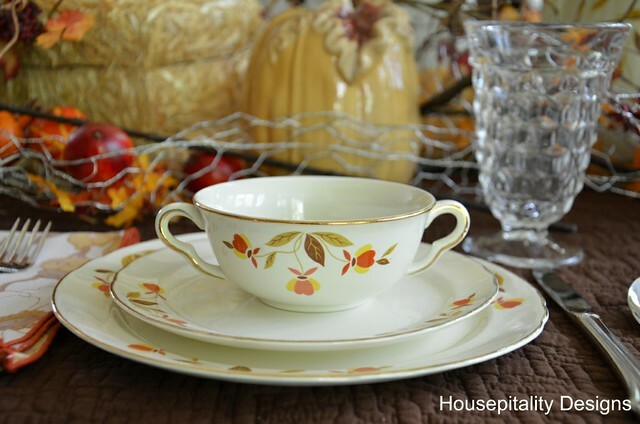 …..The table is set with Jewel Tea Autumn Leaf by Hall. 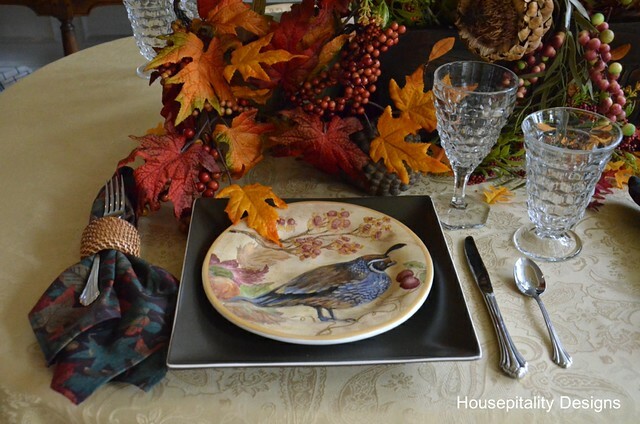 …..They were just perfect for a Fall Tablescape. 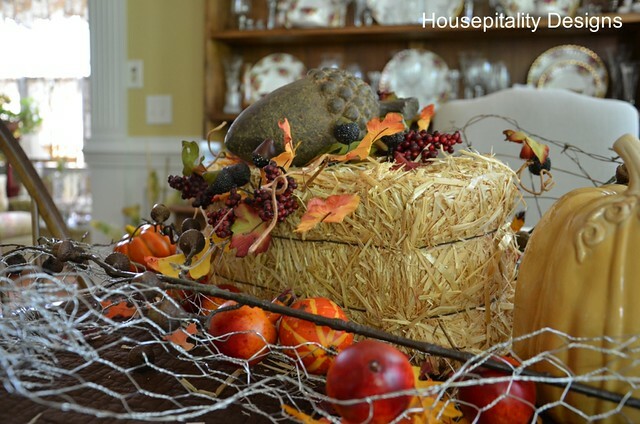 …..remnants of hay bales and garlands of acorns. 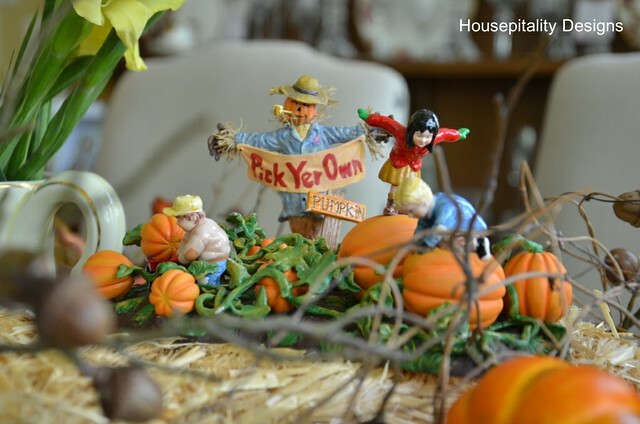 The scene of children playing in the harvested fields…. …..this figurine is by Department 56. …..a bit of the unexpected. 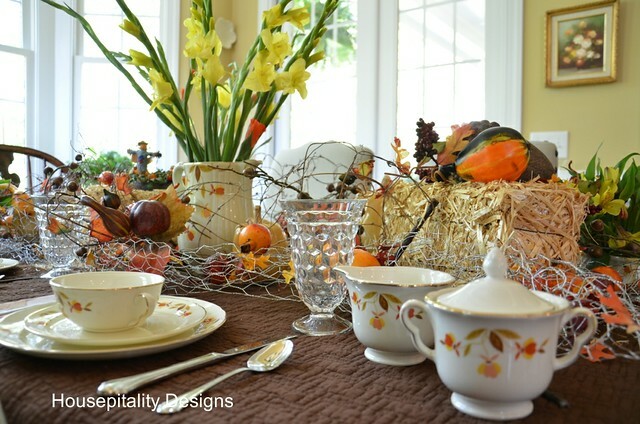 …..I am blessed to live in an area where the leaves are brilliant during the fall. ……………….at the end of July!!! 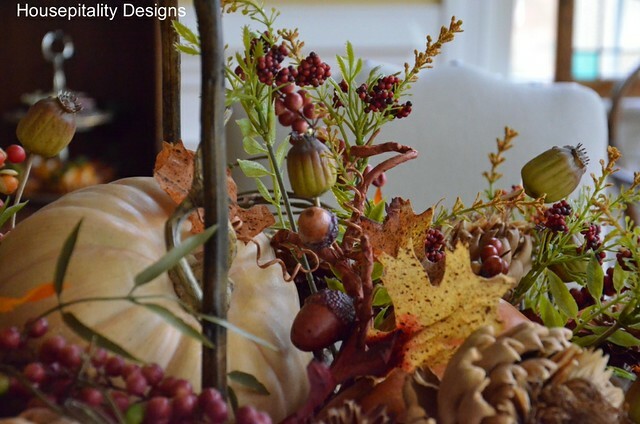 In addition to joining the Whisperwood Fall Decor Contest….